When Richard Curtis was announced as one of the writers for the new series I couldn't help but have some reservations. At worst, Curtis is indulgently over-sentimental as a writer and I did wonder what exactly the writer of The Vicar Of Dibley, Mr. Bean, Love Actually and The Boat That Rocked was going to do with a commission from his mate Moffat. Again, we were back to the same worries that circulated about Simon Nye writing for the series. Nye produced a great script that was bogged down by a lacklustre production and here Curtis bucks his disappointing trend of late with a rather good script. It does get lumbered with his trademark manipulation of the audience's emotions but on the face of it Vincent And The Doctor is certainly one of the better episodes in what has been, for me at least, a series that, bar a few episodes, consistently stumbles to match expectations. 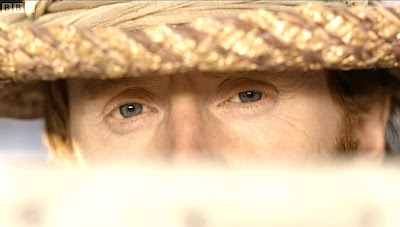 At the heart of the episode is a rather moving performance from Tony Curran as Vincent Van Gogh and considering that this was a performance for an episode of Doctor Who and not a lavish and gritty bio-pic, he was able to convey a certain amount of Vincent's torment without it becoming too disturbing for a family audience. There is no doubt that a great deal of visual license has also been taken here and the Vincent we see is definitely a kinder representation of the desperately ill man that spent his final days in Auvers. It was certainly left to Curran to portray the man's unhinged state more through performance rather than through the typical visual and physical attributes that the likes of Lust For Life and Vincent And Theo provided. Perhaps the Vincent seen here lacked the edge of those Kirk Douglas and Tim Roth performances but Curran should be rightly praised for what he managed to achieve. Much praise must also be given to Jonny Campbell, the director, as he nails the tone absolutely right and gives the episode a visual splendour that cleverly captures the intensity of Van Gogh's work, reproducing many of the signature works - The Wheat Field With Crows, The Church At Auvers - with a great deal of wit and care. Well, not quite. There are some liberties taken with the settings. 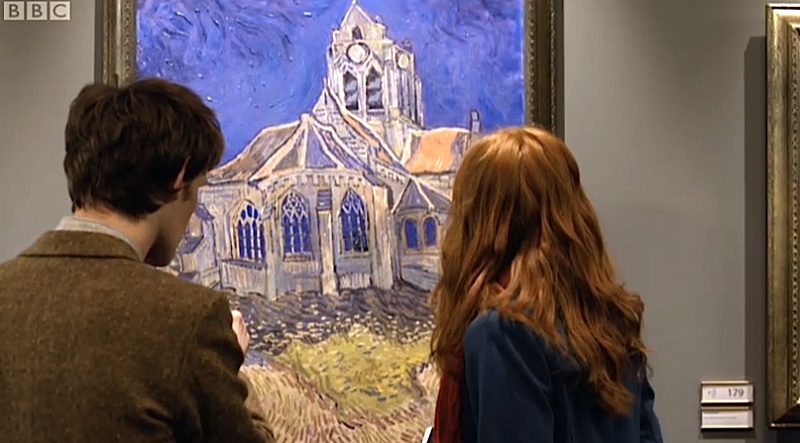 The location of the story is suggested as Auvers-sur-Oise but two of the reproductions that the episode so meticulously puts onto the screen were in a completely different location. 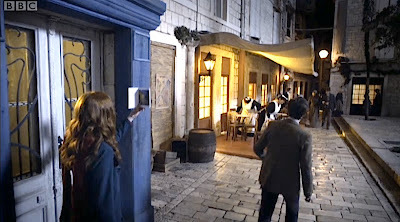 The bedroom where the Doctor goes to wake Vincent is a faithful recreation of The Bedroom In Arles painting, the cafe that the Doctor and Amy arrive at is a faithfully realised version of The Café Terrace on the Place du Forum, Arles, At Night. The episode claims that these were in Auvers-sur-Oise when in fact they were in Arles. It's not as if they were next door to each other - Arles is in the South Of France and Auvers is in the suburbs of Paris. Beautiful production design, wonderfully lit and photographed but clearly a dollop of artistic license has been used with the locations of the inspiration for his major paintings. As much of the license I suspect that was used in the various pronunciations of Van Gogh's name that litter the episode and, like the use of the paintings locations, it raises the question of historical accuracy in a series that Den Of Geek believes has returned to its Reithian 'educational' remit. Historical detail has never been one of the series strong points and I'm sure Billy Hartnell would have been fluffing all over the place ('Van Go..Goff…Guff, Chesterfield') if they'd attempted a similar story back in the 1960s. Besides, Curran's natural Scottish accent is sub-textually dismissed with a sweet joke about Amy and him sharing their origins in Holland and therefore it's clear that the production team are somewhat aware they're playing fairly fast and loose with the setting of the story. In the end, it doesn't matter because this is Doctor Who and not Vincent And Theo. The tone is firmly Curtis' romantic comedy/tragedy stock in trade and the inevitability of Vincent's career path runs like a jet black seam through the cultural tourist bedrock of the story as the Doctor takes Amy into Vincent's world on a mission to truss an intergalactic chicken that's popped up in the window of The Church At Auvers painting. The mention of Van Gogh providing his daubs 'with no hope of praise or reward', as Bill Nighy's Dr. Black intones in the pre-titles, pretty much underlines the mission statement here. Never mind the fact that art is now an international commodity that is endlessly reproduced to such a degree that iconic paintings are divorced from the context which existed at the time of their making (the discussion about the preciousness of the paintings between Vincent, Amy and the Doctor touches on this), Vincent And The Doctor instead attempts to depict the context of their creation within the series own current obsessions with seeing, perception, memory and forgetting and bravely tries to democratise the reception and appreciation of art by describing the artist's vision itself. 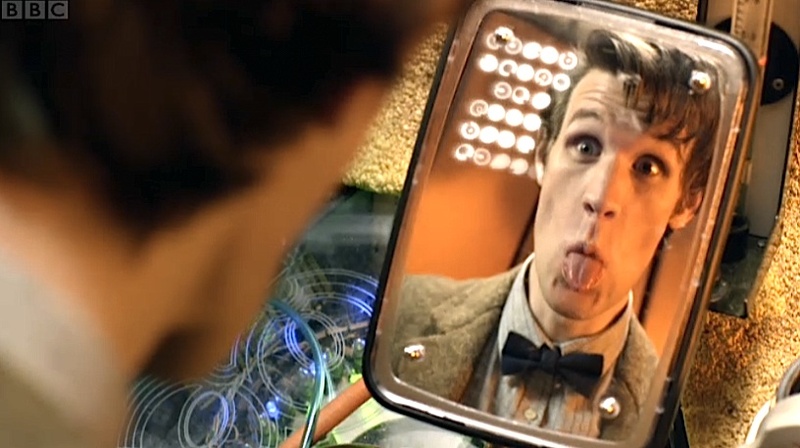 This is underlined by the driver of the story - looking at something intensely enough you see something that is beyond the normal range of perception and suggests other dimensions and worlds, both in the artist's mind and, as the Doctor and Amy discover, physically existing within the real world. How we perceive things is also neatly summed up by the Doctor's gadget which can not only reveal the existence of the Krafayis but also reproduce the various faces of the Doctor when he pulls tongues at it in his Eleventh incarnation (a little Einstein reference there, I think), Amy's referal to the book of Van Gogh postcards as the official text, and the in-joke about Impressionists ('this is the problem with the Impressionists - not accurate enough. Would never happen with Gainsborough or one of those proper painters') that gently mocks the public reception of high art. Vincent And The Doctor also pays some lip service to Vincent's bi-polar condition (the scenes where the Doctor and Vincent discuss the fact he can 'hear colours' and that 'nature is shouting' at him and later his breakdown as the Doctor goes to wake him) and briefly explores the connections between manic-depression and creative activity, the question Edgar Allan Poe himself pondered 'whether madness is or is not the loftiest intelligence--whether much that is glorious--whether all that is profound--does not spring from disease of thought--from moods of mind exalted at the expense of the general intellect.' I admire Curtis' desire to highlight mental illness in the episode but wouldn't that point have been made more profoundly if Vincent's demons, sublimated and projected into the Jabberwocky-like Krafayis in the episode, were just simply the external realisation of the man's manic-depression rather than the obligatory 'monster of the week'? 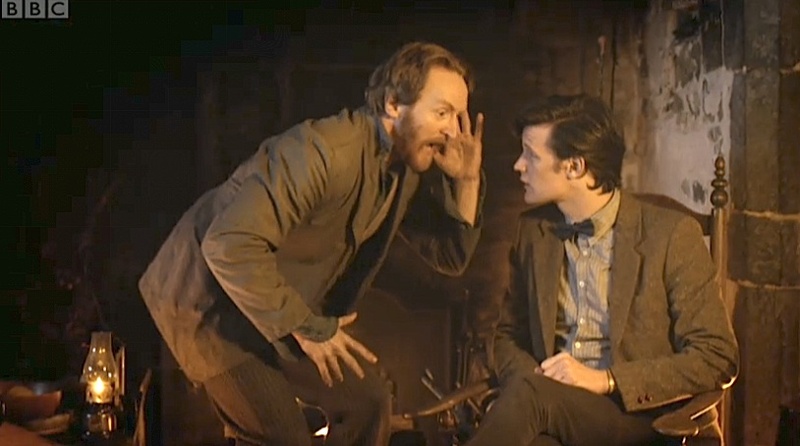 The episode suggests that if the Doctor had not intervened then the Krafayis would simply have continued to blindly stumble around the Auvers-sur-Oise countryside polishing off the odd peasant until Vincent shot himself. It would have been far better if Curtis had simply stated that the Krafayis was just one of many phantoms that the Doctor and Amy help Vincent deal with, if only temporarily. That the creature is invisible, can only been seen through Vincent's 'mad' vision and the Doctor's equally bizarre gadget, almost elevates the idea to this level. 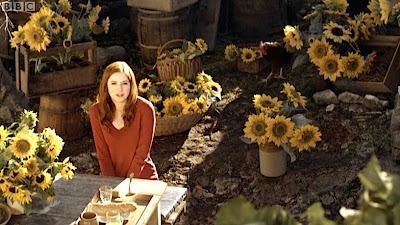 As does the metaphor of the Krafayis as an abandoned, blind orphan ('I'm afraid, I'm afraid' says the dying creature) that offers an analog of Vincent's anger ('like the villagers who scream at me'), frustration and fear at his inevitable demise, the Doctor's loneliness and Amy's dislocated sense of herself since Rory was wiped from the time stream. 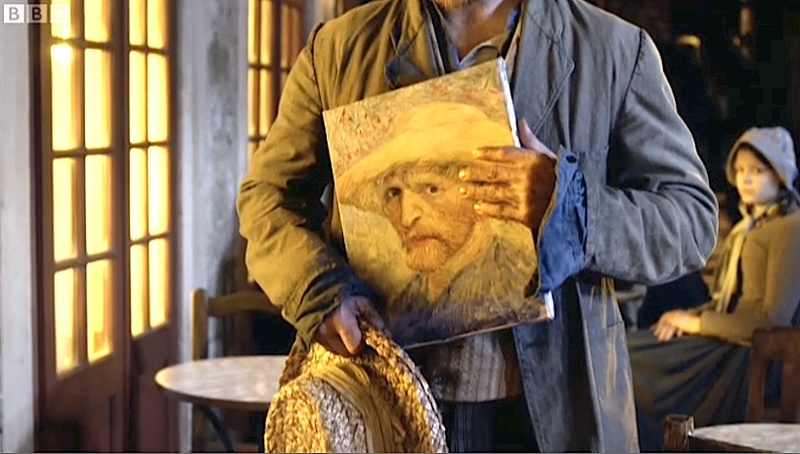 This would also have fitted more aptly with Van Gogh's use of colour for its symbolic and expressive values as seen in his paintings and with the episode's concentration on how we see the world and how some are gifted to perceive it in a particularly powerful but self-destructive way. Still, the fact that the Doctor and Van Gogh come to reproduce the 'George And The Dragon' figure that's briefly seen above the door of the church is both satisfying in its physical realisation, where Van Gogh symbolically uses the power of art, in the form of the easel, to fell the Krafayis beast, and in its nod to the 'slay the dragon' techniques used in hypnotherapy and psychotherapy where clients are required to identify their particular 'dragons' and use particular triggers to deal with recurring trauma. There's also a hint here of the mythical hero's journey that takes us back to Joseph Campbell's The Hero with a Thousand Faces, in which he delineates the stages and common elements found on the hero’s journey as a form of transformative psychotherapy. As it is, the episode's 'cultural tourism' is rather blunt, even if it is beautifully realised, and the cachet of the 'celebrity historical' relies a little too heavily on the naturalising of recognisable cultural figures within a 21st century milieu, complete with the ever reliable excuse of 'alien monster' to drive what could have been a truly extraordinary drama about the areas of genius and madness that both Van Gogh and the Doctor oscillate between. Here, it really is a case of if not being necessary to depict the symbolic monster projected from Van Gogh's troubled mind as an actual, physical monster from another world to maintain the series credentials as fantasy or SF. Despite this concern about how physically realised Van Gogh's inner vision should be, we do get that rather lovely scene where Vincent, the Doctor and Amy lie down in the grass (emulating that 3D trailer that initially promoted the series) and they all try to see what Vincent sees. 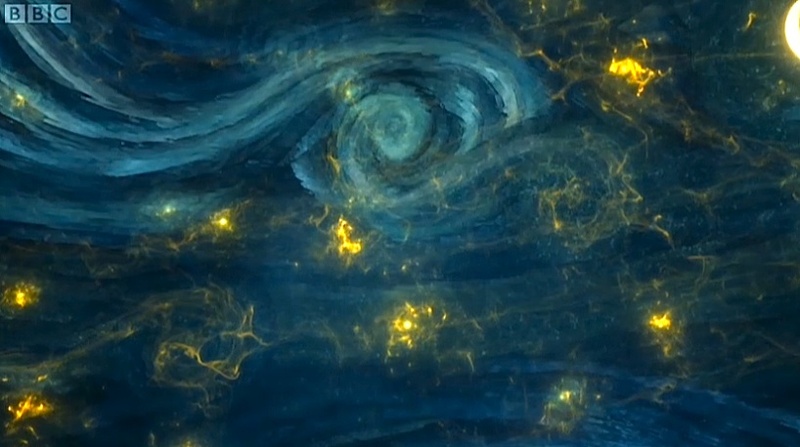 The night sky is transformed into the swirls of his iconic The Starry Night painting and the episode makes a supreme effort to let us see the world from Vincent's point of view. It's a captivating moment that at least tries to make you understand what his artistic vision was attempting to achieve and is far more effective than the litany of Shakespeare quotes or the use of titles in the Christie pastiche that have stood in for what was supposed to be the genius of the written word in previous episodes and where the private pain of both figures was barely articulated. The Starry Night is one of his most popular works and here the sky transformed into swirling lines and glowing orbs suggest a possible representation of his mental state and embody an inner, subjective expression of Van Gogh’s response to nature. For the Doctor and Amy it is as if they are seeing the energies that bind the stars and planets together for the first time, without the use of technology as a frame of reference. Vincent once said “Looking at the stars always makes me dream. We take death to reach a star,” and that's worth bearing in mind as the Doctor takes him to the stars and through time to allow him the grace to understand that whilst he suffered and died to reach that star, that apex of his creativity, the star continues to shine brightly long after his tragic death. 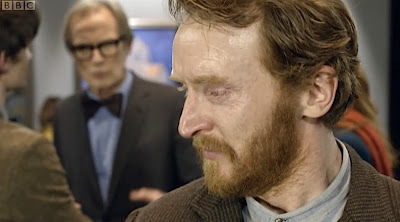 What follows is a very powerful scene with Tony Curran completely stealing the episode as Vincent, overcome with the sheer joy and utter shock at the 'Van Gogh love' in the room as the camera spins around him in the gallery at Musee D'Orsay. A lovely, life affirming moment and where even Bill Nighy, as the gallery expert Dr. Black, manages to remain understated. Which is more than you can say for the irritating pop song smothered all over the start of the scene to tell you 'this is the bit where you must cry'. It didn't need it because Curran and Nighy can make you cry at the drop of a hat in that scene through the sheer quality of performance. However, Curtis just can't bloody help himself. It's a good ending as it is despite the music, gives Vincent an emotional moment of triumph that any neglected artist would desire but doesn't tamper with or damage the fixed point in time that is his sad demise. It's the way of the world and Van Gogh's reputation must always remain post-humus and it's rather dim of Amy to think she can change that. So, it also works as a practical lesson for her. Good, leave it at that and with the Doctor's sweet 'pile of good things and bad things' speech. As they stare at the windows of The Church Of Auvers painting and declare 'No Krafayis' I really would have preferred 'cue end titles' at that moment. Instead, Curtis has to have that final zoom into the classic Sunflowers canvas with the 'For Amy' dedication. 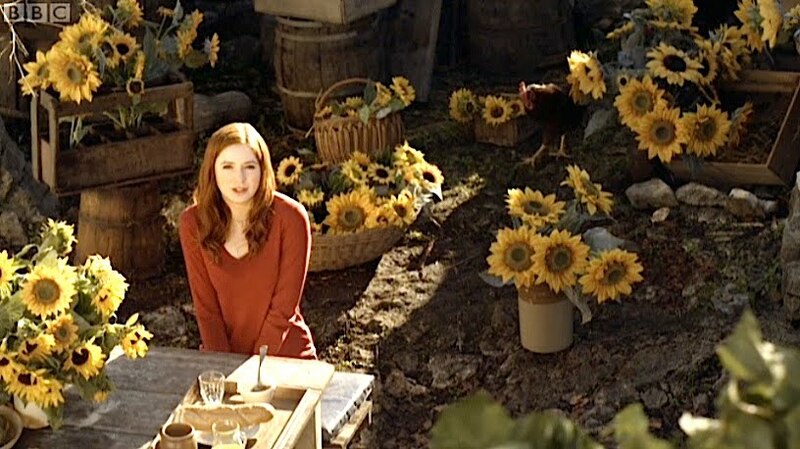 It's clearly not enough for him to show the removal of the Krafayis from a painting or suggest Vincent's inspiration earlier in the episode is Amy not so subtly sat in the middle of loads of sunflowers. As a scene that was good enough without being too trite but to then suggest that an artist who clearly sees nature through the prism of the unconscious and through the intensity of his bi-polar condition would then daub 'For Amy' onto a canvas of sunflowers, flowers he describes as a metaphor for the brevity of life and the inevitability of death, just smacks of poor judgement to me. We get it, Richard. For a brief moment, the Doctor and Amy revealed Vincent's humanity and we saw the troubled man's psyche as the catalyst for his art and now because you feel you haven't manipulated the audience enough you slap on the corniest, most contrived coda in the book. To that end, why wasn't Dr. Black suddenly very suspicious at the changes in the painting and asking for it to be verified as a fake? It's an illogical device to use especially when the painting that has the dedication was completed a year before the episode allegedly takes place. So Vincent, feeling a bit chipper, went back and dedicated a completed canvas to a mouthy Scottish bint from Holland who came on strong to him in a cafe? Right. 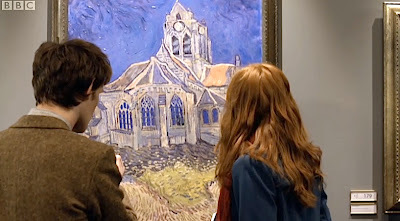 A pity then, because this is certainly one of the better episodes this year and despite the final manipulative twist from Curtis, the scene of Vincent in the Musee D'Orsay must stand out as one of the more moving sequences in the revival of the series even though in itself it seems at once both a generous and a cruel thing for the Doctor and Amy to show him his future, the Doctor knowing that tragedy will not be averted and Amy believing it can, before he walks into that wheat field and shoots himself. Great review, as per usual. Completely agree about the "For Amy" bit, although I assumed that Dr. Black wouldn't question it because that is the one Van Gogh painted - it would be what he had always painted, and it would just be part of the work. The scene in the Musee D'Orsay at the end of the episode is the only time I've cried (or even got close) since watching Bambi, aged four. Very moving. Oh, yes. He's gone and created yet another time stream hasn't he. That makes Curtis' self-indulgence even worse!